This gorgeous villa in Rayol-Canadel-sur-Mer is located at a great location, right by the ocean. 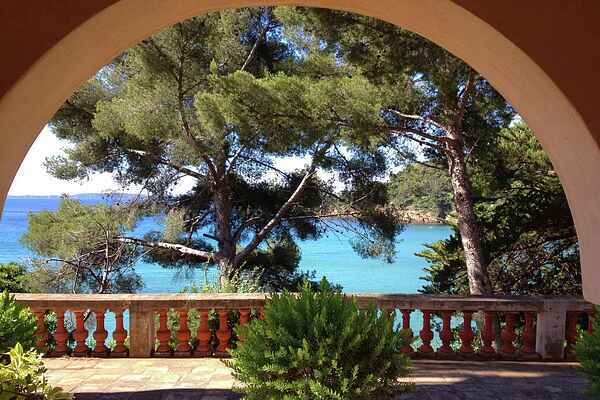 From your own deck you have direct access to the Mediterranean Sea, ideal for a quick swim. The villa is situated ten kilometers from the quaint seaside towns of Le Lavandou and Cavalaire-sur-Mer. On the walls you'll find murals by the famous French artist Jean Cocteau, who is one of the previous owners. The house is equipped with beautiful tile floors and wooden floors. If you follow the coastal road west, you'll pass by the villa of Carla Bruni and the presidential retreat (Fort Brégancon). You can take the boat in the harbour of Le Lavandou and travel to the Ile de Porquerolles and Ile de Port-Cros islands. There is an 18-hole golf course (Golf de Valcros) 18 km away. For the daily groceries and a bakery you can go to Rayol-Canadel-sur-Mer (1 km). There are several attractions in Hyères (35 km), such as the Templars tower in the old city center and a Moorish style villa in the city center. You might spot celebrities in Saint-Tropez (28 km). Maybe you'll end up sitting next to them on a terrace.